General Motors says it is fixing problems and proving performance for its showcase plug-in hybrid Chevy Volt, set for production late next year. 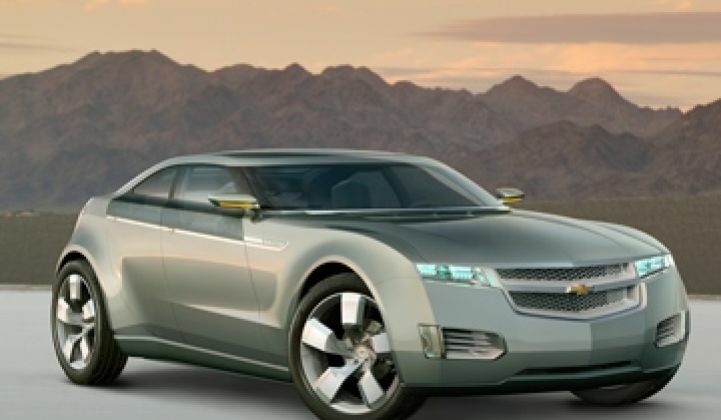 The Chevrolet Volt, General Motors' showcase plug-in hybrid car, is still set to start rolling out of factories in November 2010, despite losing $1.2 billion in its most recent quarter. That means the company's engineers are working under a 12 month deadline. Two of them – Andrew Farah, Volt chief engineer, and Bill Wallace, engineering group manager for GM's self-designed Voltec battery – gave an update on the Volt's progress on Tuesday. So far, about 80 test models of the plug-in hybrid have driven some quarter-million miles in testing, including hot-weather testing in California's Death Valley and a run up Colorado's Pikes Peak to test its mountain-climbing capabilities, Farah said. GM has also tested about 300 lithium-ion battery packs that it has assembled from cells made by Korea's LG Chem, Wallace said. GM is putting about $43 million of the $241.4 million it received in federal stimulus grants into its Brownsville Township, Mich. plant to produce those battery packs (see Green Light post and Feds Give $2.4B to Battery and Electric Drive Projects). The plant will start turning out its first batteries in February, Wallace said. GM has tested 50,000 battery cells so far, and "we haven't had a single cell failure at this point in time," though it has made some minor adjustments to battery chemistry, he said. GM has tested the Voltec battery pack's ability to withstand corrosion, and has also put the Volt through crash tests, which indicate that the T-shaped battery pack that sits in the center of the car is well protected, the engineers said. As for battery life, GM is still working on specific performance figures, but has targeted a 10-year lifespan. Customers could hot environments could see less than optimal battery life, but those who live in temperate environments could see batteries last longer than 10 years, Wallace said. Of course, "Our whole goal here is to put together a great vehicle for customers, not just a great battery on wheels," Farah said. "We are always balancing performance, durability packaging and of course, interior and exterior design." For example, GM found that the Volt was noisier than expected, and has made changes to fix the problem, Farah said. Road noise is more evident in the Volt, since it runs on a battery and uses its gasoline engine only to charge the battery, he noted. The engineers didn't specify how large the Volt's gas tank would be, however. GM came under some criticism in August after it claimed that the Volt would be able to get a 230-miles-per-gallon rating for city driving under a yet-to-be released EPA methodology – a claim the EPA said it could not yet support (see Chevy Volt Claims 230 Miles Per Gallon in City Driving). "We're finding there's still quite a bit of evolution in regulation that's going on relative to electric vehicles." Farah said Tuesday.